This 252-page paperback is a printed snapshot of the Online Dictionary of Crystallography. It is a reference for authors and referees of IUCr Journals and for research professionals in general: but will also be useful to students and to the general public. The book will be available in limited numbers at the IUCr Congress in Montreal, at a specially discounted rate (16 CAD, 11 EUR, 9 GBP). Email us to reserve your copy for collection at the Congress (reservedict@iucr.org). 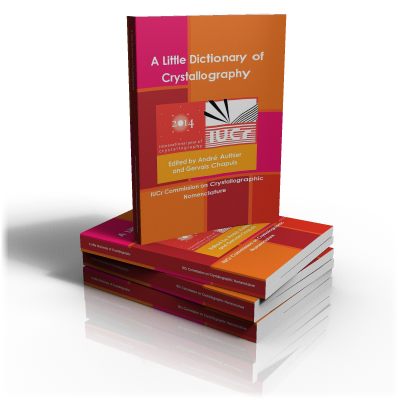 Copies will be generally available from 16 August 2014 at http://www.lulu.com/content/paperback-book/a-little-dictionary-of-crystallography/13926339. The price will be GBP 15 plus postage and packing. Here you will find a number of directories of information useful to practising crystallographers. We welcome suggestions for new directories, and new information or updates to existing information in any of the listings provided here. Please contact the News Online Editor with your suggestions and comments.